This year alone the business has grown by more than 50%. Margin had definitely increased as a result of using Trader. Visibility of cost prices at point of sale and consistent contract pricing helps to ensure that we sell at the best margins possible. Bar-coding means that stock records are 100% accurate – even down to product variations such as size and colour. Cornish Lime, now a long standing customer selected Trader after researching to find the right IT system to manage shop sales and integrate with back office processes. 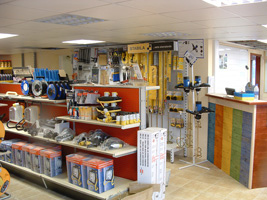 Established since 1991, The Cornish Lime Company, provide specialist building materials to over 300 regular customers. When its trade shop opened 2 years ago, Shop Manager, Mark Joliffe was eager to find the right IT system to manage shop sales and integrate with back office processes. “Before the shop opened, a system was already in place which basically dealt with our accounts and generated invoices. The old system was cumbersome and I felt it was holding the company back. My specification for a replacement system included Electronic Point of Sale and bar coding features specifically; plus general improvements in the quality of information available in the system and comprehensive management reporting. When I looked at the Trader™ system, I could see that it is very similar to what I was used to using at Jewsons. The basics of Trader™ are easy to use and the ability to drill down to information such as cost prices and purchase history by customer instantly answered some of the key frustrations we had with the existing system. “This year alone the business has grown by around 50%. Turnover was £800k last year; this year it’s risen to around £1.2m. Trader™ has become the driver behind our marketing and promotions, helping us to shift slow-moving stock and encourage customers who haven’t visited for a while. Margin has definitely increased as a result of using Trader™. Visibility of cost prices at point of sale and consistent contract pricing helps to ensure that we sell at the best margins possible. I use the profitability reports to monitor how we’re doing on a daily basis. “In many ways, Trader™ has helped us to ensure that The Cornish Lime Company is more organised, better informed and projects a professional image to our customers.